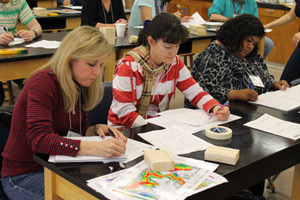 This section provides access to a spectrum of visualizations and supporting material that can be used effectively to teach students about energy. Visualizations include simple animations, videos, maps, illustrations, etc. If you would like to share a visualization, you can contribute an energy visualization to this collection. How a Coal Power Station Works (more info) This two-minute video tours a coal power station in Ontario to show how coal is used as an energy source. It includes animations to demonstrate machinery used at the plant. University of Kentucky: Coal Formation (more info) Supplementary material from Understanding Earth (4th ed. ), this short animation guides viewers through the formation of coal and its pathway through different grades. The animation is annotated with labels. World Oil Consumption - 3D Charts in Google Earth (more info) This site, part of the Google Earth blog, provides 3-D graphs of the world's oil consumption by country, both raw use and per capita. The data comes from the CIA World Factbook. The teaching activity Energy Consumption Rates across the USA and the World, part of the SERC Pedagogy in Action example collection, uses this data at an undergraduate level. Adventures in Energy - An Interactive Look at Oil and Natural Gas (more info) This interactive learning tool from the American Petroleum Institute offers a primer on oil and natural gas by providing several animations with explanatory notes covering topics such as: what are oil and natural gas, exploration and production, processing, oil tankers, refining, pipelines, and oil and natural gas in your life. Each section has several parts and includes a short quiz at the end. USGS Video: Future of Energy Gases This narrated 30-minute video can be viewed with Windows Media Player and provides a primer on how gases are used as energy sources, how they form, and the future of energy gases. It includes both motion picture and animations. Oil Formation (more info) An animation showing how oil deposits are formed. Click the arrow button to reveal the stages involved. Explanatory text describes the process. Oil Formation and Trapping (more info) This animation from the Essential of Geology textbook provides a captioned animation for how oil forms through increasing temperature and pressure and how it is trapped by impermeable layers. The Oil Refining Process (more info) This site, from the Learning Centre at the New Zealand Refining Company Ltd., hosts a collection of annotated diagrams and pictures of various stages in the oil refining process. Users can click their way through the site to learn somewhat technical details of oil delivery, storage, and refinement. 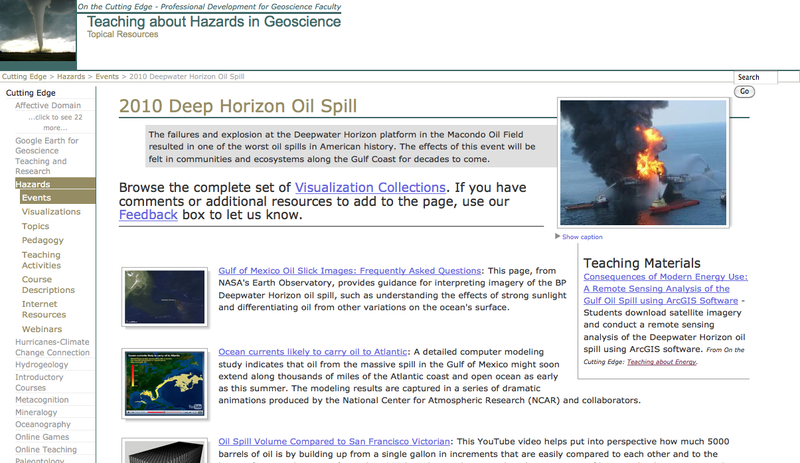 Deepwater Horizon Oil Spill: Visualizations from the 2010 British Petroleum Deepwater Horizon oil spill in the Gulf of Mexico. Nuclear Reactors (more info) This site from the NRC provides animated diagrams of the two types of nuclear reactors used in the US, the pressurized water reactor and the boiling water reactor. How a Nuclear Power Plant Works (more info) This 88-second video from YouTube shows a labeled computer animation of how a nuclear power plant works to create energy. Nuclear Power Plant Simulator 1.30 (more info) This site allows users to download a program in which they simulate running a nuclear power plant. Users learn about energy generation and its limits by walking the fine line between not enough energy produced and nuclear meltdown. 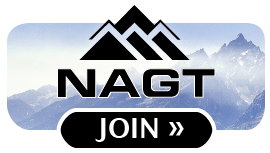 The demo version of this program allows users 40 free simulations and a full version (with no simulation limits) is available for purchase. Nuclear Fission (more info) This short animation from TERC's Exploring Earth visualization collection provides a primer on how nuclear fission works. Ecopolis: Biofuels (more info) It also discusses disadvantages of current biofuels and how algae will overcome these disadvantages. How a Geothermal Power Plant Works (more info) This site from the US Department of Energy provides a primer on how geothermal energy works via several animations as well as supplementary text. 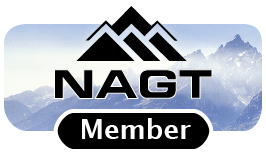 The site also provides links to publications, photographs, maps, educational resources, industry links, and homeowner links. The Danger of Digging Deeper (more info) In this short video, James Glanz from the New York Times explains the earthquake risk posed by a geothermal dig in California. This resource also includes a link to a related article from the New York Times. How Hydroelectric Power Works (more info) This 2-minute YouTube video guides viewers through how hydroelectric power works with Niagara Falls as an example. Animations supplement an explanation for specifics of physical processes involved in energy generation. Germany's Solar Experiment (more info) This NOVA video podcast is about Germany's solar experiment. Munich's solar panel farm lines the Autobahn and countryside in a massive effort to prove solar's feasibility as a practical renewable energy source. Wind-to-Hydrogen Project (more info) This site describes the National Renewable Energy Laboratory's Wind to Hydrogen Project (Wind2H2). The Wind2H2 project links wind turbines to electrolyzers, which pass the wind-generated electricity through water to split the liquid into hydrogen and oxygen. The hydrogen can then be stored and used later to generate electricity. The site includes two visualizations, a video describing the project and an animation demonstrating the system's components. The Wind Business (more info) It can take years to plan and engineer a state-of-the-art wind farm. It is a problem-solving process that draws on an understanding of algebra, geometry, kinetic energy, electronics and just about everything in between in order to turn one of our most abundant natural resources into a viable business. This 6-minute video covers several aspects, from the construction and siting, wind analysis, and merging of wind farms with agricultural land use. Wind Power Animation (more info) This animation, from the US Department of Energy, discusses the advantages of wind power, the workings of a wind turbine, and wind resources in the United States. It also describes how wind power is used in small- and large-scale applications. Map of Offshore Wind Energy Activity in North America (more info) This map, from the North American Offshore Wind Project shows a Google map of all locations considered for having offshore wind energy. The location markers also provide information as to which projects are operational, proposed, suspended, or that have notable activity. Slide Show: The World's 10 Largest Renewable Energy Projects (more info) From wind and wave to sun and trash, a look at how existing power plants are providing electricity generated from renewable sources on a massive scale. BP Energy Charting Tool (more info) This charting tool, supplied by BP, charts world energy consumption (by type of energy) over time. Users can also choose to chart other energy usage data (e.g. usage by location or production data) from these years. History of Energy in the United States: 1635-2000 (more info) This website, from the US Department of Energy, provides a history of energy use in the US from 1635-2000. It includes several figures showing how energy sources and consumption have changed through time. 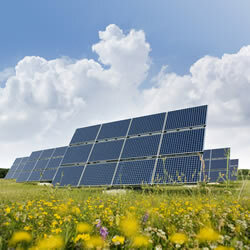 Energy Sources (more info) Innovation has allowed societies to tap into a wide variety of energy sources. This video segment, produced for Teachers' Domain, identifies some of these sources, discusses their benefits and drawbacks, and explains how they are used to produce energy that people can use. Geology of Hydrocarbons Visualizations (more info) This site has over two dozen animations about hydrocarbons as energy sources, including where resources are found, the amount of each energy source/type used in the US and in the world, how hydrocarbons are formed, and how they are found by exploration geologists. Earth Science Australia Energy Collection (more info) This site provides a collection of visualizations involving energy. It includes visualizations for oil and gas formation, exploration, and refinement; different types of traps (e.g. domes, faults, unconformities); coal formation and mining; geothermal energy; solar energy; uranium deposits; hydroelectric power; fuel cells; wave power; wind; and biofuels. Visualizing The U.S. Electric Grid : NPR (more info) This site, from NPR, provides a map of the electric grid in the US. Users can find maps of how the grid is connected across the states, where different power sources are used, where power plants exist, and where wind and solar power resources are being used.